ALMERE (Neth.) - Dutch righthanded pitcher Donny Breek has signed a 7-year contract with the Minnesota Twins, as was announced on Thursday (September 28). The 17-year pitcher is the latest player from the Netherlands to start a professional career. Earlier this year, infielder Oliver van der Wijst Severino signed with the Houston Astros and made his professional debut, playing in the Rookie League. Breek, who turns 18 in November, will report to Minor League Spring Training in February/March next year and then will be assigned to a team. Dutch pitchers Taylor Clemensia and Matz Schütte also play in the Twins-organization. This year, both played at the Rookie League-level. After completion of his professional season, Clemensia pitched in some games for Hoofddorp Pioniers in the Championship Pool. 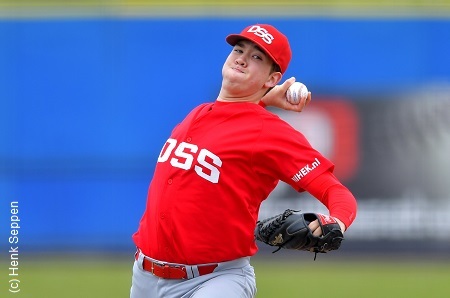 Last year, Breek made his debut in the Dutch big league, pitching for DSS. He then was 2-8 with a 7.51 ERA. In 50 1/3 inning, he struckout 33 batters, but also walked 44 and gave up 61 hits. In the following Play-Downs, Breek was 1-1 with an 1.59 ERA and 11 strikeouts in 11 1/3 inning. This season, DSS succeeded in securing its spot in the big league for next season, finishing in second place in the Promotion/Relegation Pool, as led by Donny's father Jerry Breek, who made his debut as Head Coach of the team. In the regular season, Breek was 1-3 with a 7.95 ERA and struckout 34 hitters in 48 2/3 inning, while walking 39 and giving up 58 basehits. In the Promotion/Relegation Pool, Breek was 2-0 with an 0.84 ERA and struckout 14 hitters in 10 2/3 inning. After completion of the 2016 season, Breek won the Roel de Mon Award for Best Youth Pitcher. Breek was then also named Talent of the Year in both Almere and Haarlem. Last month, Breek, who started his career with Almere '90, participated with the Netherlands Under-18 Team in the Under-18 World Championship in Canada. There, he struckout 18 hitters in 16 2/3 inning, while giving up only two earned runs. It was there, that Breek caught the attention of professional scouts. Earlier, Breek was a member of the Netherlands Youth Teams that captured the titles at the European Under-15 Championship (Cadets) (2013 in Sweden and 2014 in Germany) and European Under-18 Championship (Juniors) (2016 in Spain). In the past, Netherlands Team-pitchers as Alexander Smit, Tom Stuifbergen and Loek van Mil also pitched professionally in the Twins-organization. Copyright © 1997-2017 Marco Stoovelaar / Grand Slam * Stats & News.